1 Food Quality : Food to satisfy the requirements of the provisions or potential features and characteristics in order to reflect the sum of the merits of food quality . 2 Food safety : do not make a guarantee that consumers suffer when their intended use for production of food and eating . 4 Quality Inspection : Testing with certain tools and inspection methods to measure the quality characteristics of the product and the results measured with the required quality standard for comparison , thus making the product qualified or unqualified judgment. 5 production license system QS: AQSIQ safety standards meet the basic requirements that must be met in accordance with the food quality. From 10 areas to develop raw materials, production equipment, process , product standards , testing equipment and capabilities , such as the strict specific requirements, while only 10 areas audited by these companies are allowed to produce food , in order to affix the QS mark after passing inspection enter the market. 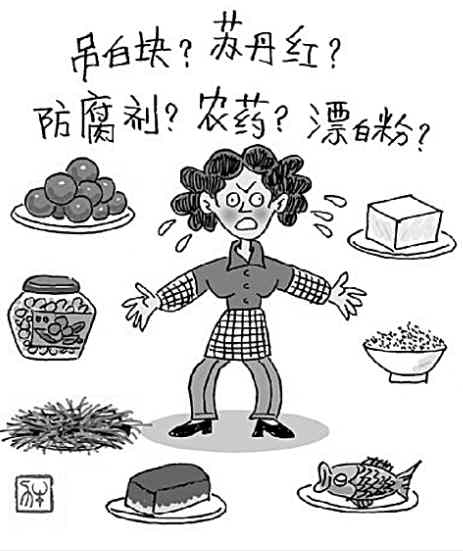 6 critical limits : a precaution with each CCP associated criteria that must be met , it is the limits of acceptable and unacceptable when determining food . 7 Food Additives : In order to improve food quality and color , smell and taste as well as the need for corrosion protection , preservation and processing of food and adding synthetic or natural substances. Causal Figure 8 : An analysis of the quality characteristics ( results ) for the factors that may affect the quality characteristics ( reason ) is a tool. 9 Food Recall : refers to food manufacturers , importers or distributors when informed of its production , import or distribution of food presence may endanger consumers' health , safety defects , according to government reports to timely inform consumers and withdraw from the market and consumers have a problem foods , take the replacement , compensation positive and effective remedies to remove deficiencies in the system of food hazard risks. 10 Green : follow the principles of sustainable development, in accordance with a specific mode of production , by the specialized agencies , licensing the use of non-polluting green flag safe, high quality , nutritious food . 11 Organic Food : According to organic agriculture and organic food production, processing standards produced through organic food certification organization issued a certificate of foods. 12 sampling : randomly selected from a large number of products in a number , this number by examining the quality of the product to determine the quality of the entire batch of product is qualified as a test method . 13 Inspection Manual : regulations and technical specifications document quality inspection activity summary. 14 commonly used statistical quality control methods: stratification , the questionnaire method , scatter method, Pareto Law , causal analysis, histogram , control charts , etc.